When Nintendo Labo launches this April, it will come with a feature called Toy Con Garage that lets you use rudimentary programming to build and customise your own cardboard robots, Nintendo announced today. Some of the custom toys Nintendo showed off included an electric guitar and a basic game of electronic tennis. At an event in New York this afternoon, Nintendo representatives demonstrated this Toy Con Garage, which uses simple “building blocks” to let you program your devices. They’re essentially “if-then” statements. When you open up the program, you can select from a number of blocks based on input options for your Switch’s controllers, then connect them to other blocks based on output options. For example, you can connect the left Switch controller’s B button (input) to the right Switch controller’s vibration feature (output), so whenever you press B on the left Joy Con, the right Joy Con will buzz. 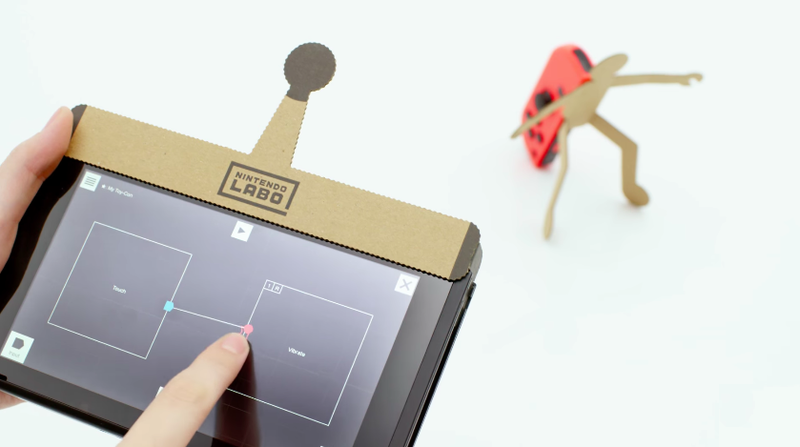 This is how Nintendo Labo users will be able to expand beyond the six types of cardboard creations included in the Variety Set or the one included in the Robot Set. Instead of making a piano, you can make a guitar. Instead of making a toy car, you can build a little cardboard man who falls flat on his face. You can mix and match different programs’ functionality—using the fishing rod to play music, for example—and you can even add extra Joy Cons to build even more elaborate programs. The building blocks look like that. We’ll have more on Nintendo Labo, including hands-on impressions and videos, in the very near future. The wild new cardboard toys come out on 20 April.